Garry Dodd (pictured) denied Phil Ogier a second straight singles title with a 3-1 win over the Senior Group champion in the season's second major - the Whistlers Open. There was a high-quality last eight emerging from the qualifying stages, but Dodd came good with some high quality play required to see off Ogier, who seems to get better with age. Things may have been different had Ogier taken the first, but from 4-8 down Dodd surged through 11-8 and although he dropped the second 12-14, the left-hander hit back to take two cracking sets both to eight and lift the trophy for the fifth time. The defending champion, Lawrence Stacey, found himself in one of seven groups of four among the 10 in total catering for the 37-player entry. None of his first-round opponents were likely to cause him any grief and that turned out to be the case as he won all three to reach the last 16 and knockout stage without dropping a game, only to lose to Ogier in Group qualifier. 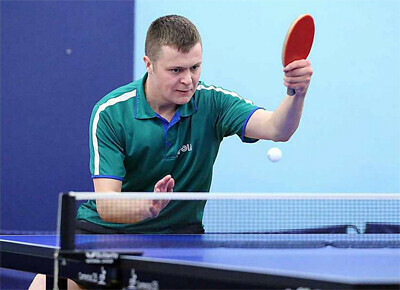 Other notable group stage results saw Kay Chivers defeat the group seed Chloe Le Tissier in straight games and there was another win for the oldies when Chas Elliott dug deep to defeat young Ben Foss in a terrific five-setter. Elliott kept himself alive in the match by taking the fourth set 18-16 and in the decider sneaked home 11-9 to earn himself a clash with Alex Robinson. That was as good as it got for Elliott, but he should be pleased with his form less than three weeks before the Ravenscroft CI World Ping Pong qualifier in which his style is particularly suited to the hardbat format. It almost did for Alex Robinson, but having established a 2-1 lead he dropped the next two sets including the last, 11-8. Robinson went out to Dodd in the quarters from which Jez Powell and Joshua Stacey were also to win through only to lose at the penultimate hurdle to Dodd and Ogier respectively.